I agree wholeheartedly that Obama is indeed a brand: see the above photo. He even has a logo. His image and his message of "change" is one that hits home with people; this word represents a step away from the past 8 years, which market research-driven tactics like polls and surveys have proven to hold very negative feelings and thoughts (as of a recent Gallop poll, President Bush's approval rating is at an all-time low of 27%, whereas the percentage of American's who express satisfaction with the state of the country is a meager 7%). In this sense, Frank Luntz is correct when he says that when choosing language to use, in both commercial and political advertising, "it doesn't matter what you want to tell the public; what matters is what they want to hear". Do any of us remember seeing Kerry or Gore's face on t-shirts worn by the young and old alike? I certainly don't, at least not in the proliferation that Obama shirts and hats and buttons are seen in this city (granted, New York is decidedly more liberal than conservative). The same thing, however, is happening with Palin. "Hockey Moms for Palin" or "Lipstick Republican" shirts are also seen in proliferation, maybe not in New York but certainly at Palin rallies and events across the nation. These images that the candidates present to us SELL, which undoubtedly equates the candidates to a brand name for each respective party. Douglas Atkin, one of the persons interviewed during the "Emotional Branding" segment of The Persuaders (which you can watch online at pbs.org here), spoke to the idea of the cult-like devotion that some people have with brand names (think of Mac users, Harley riders, WWE fans, etc. ), that being in a cult was like "belonging to the tribe". There is a need to belong to something that some could argue is inherent in us. Therefore, the goal of the emotional marketing campaigns of the 1990s were focused around this idea of cult-like devotion, which still works in the realm of political advertising. This is similar to what Benjamin speaks of when he mentions the "cult of the movie star", which raps the public with the "phony spell of [the] commodity" of the actor or actress in a film (27); really, these politicians we see in the election process are no more than commodities being sold to us by a political party. I have spoken with friends about how much it disturbs me that I myself have fallen victim to the wordage and persuasion of the Obama campaign, that I support him and really stand behind who he is unlike any other candidate I've ever voted for (well, this will be true in about 3 days) and that I know I have been blinded by his advertising, by the promises that his brand name will (so they say) deliver. And of course, I know that if all goes horribly awry, it could very well be that I, like the rest of us Obama supporters, have been fooled. Fooled into thinking change is actually a possibility, fooled into supporting a candidate that won't get anything done, fooled into thinking that he's going to stand by his ideas and promises like every other politician swears they will...Because in the end, Obama is still a part of the political machine. He's still there on Capitol Hill, still a part of "the problem in Washington". Much like belonging to "the Saturn family" (which, before I moved to New York, I also was a "part" of, only insomuch as I owned a Saturn and would defend the honor of that car against all reason...really, it was a great, 30 MPG, safe vehicle! 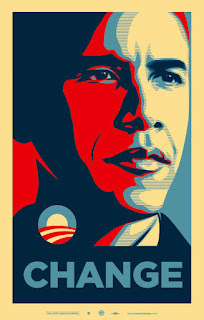 ), Obama has created a brand name that is synonymous with hope and change, and I've definitely bought what he's selling. Poster, is so WPA generation. Curious.